There were banks of cameras, security details, a sold-out stadium; reporters, flown in from all over the country, roaming the stands, looking for African Americans and/or racists; lines of autograph seekers who had waited for hours; a standing ovation led by the third-richest man in the United States and joined by the very richest, with John McEnroe separating them for good measure. And there was visible emotion on Serena Williams’s face. No one called the event just what it was: a women’s second-round tennis match at the BNP Paribas Open. It would have seemed odd, even a little offensive. Instead, even before that Friday night, it was presented as a moral victory, an inspiration, the conclusion to a narrative of growth and progress. If you follow tennis at all, you probably have some sense of the arc of the story. At the 2001 Indian Wells final, after Venus Williams pulled out of a semifinal match against Serena because of tendinitis in her knee, Serena, Venus, and their father, Richard, were booed by the overwhelmingly white, wealthy Indian Wells crowd. There were rumors that the semifinal match had been fixed by Richard; there were hecklers and a racially charged atmosphere. The stadium reverberated with a wild, hateful, unrelenting sound. At a special pre-tournament press conference, Williams sat in front of a room packed with journalists. She was coiffed and practiced, generous and poised, flashing a wide, ready smile. “Years ago you always followed Venus. You’ve taken a lead role. Talk a little about that, how important that is in your life to learn how to forgive and move on,” a reporter prompted her. “You said that you learned more about the meaning of forgiveness. Can you reflect on that?” asked another. Nelson Mandela’s name was invoked. The reporters were following Serena’s lead, of course, and she responded to them with eloquence and grace. It was a good day for tennis, people said; tennis was beside the point. But during that match, on Friday, March 13, something strange happened. Williams, facing Monica Niculescu, ranked 70th, started by spinning in slow serves. She was broken in the first game and lost five of the first six points. She struggled to react to Niculescu’s unorthodox forehand, a kind of scything slice, and found herself unable to get into a rhythm. At times, she looked like she might cry — not with pride or joy but frustration or fear. It seemed as if she was wrestling not only with Niculescu’s weird game, and not only with the hypercharged emotions of the night, but also with something I hadn’t taken into account: winning. Indian Wells used to be a place where Serena won. She won her first professional match there (doubles, with Venus) and had her first really significant victory there, beating Steffi Graf in the 1999 final. Serena won her first professional singles match nearby, at La Costa; last week, she went back to take a picture of the court. And Indian Wells was nice for her, too, because her family was close by, and winning was always a family affair. Indian Wells is about two hours away from Compton by car, although it might as well have been a colony on the moon for all that the two places had in common. Compton was wrested from nature by concrete, chain link, crime, and systemic injustice. Indian Wells was transformed from an expanse of sand into an enclave of privilege by white wealth and by water. As I write this, I’m looking out onto one of the golf courses that surround my hotel. It is lush and absinthe green. Not a blade of grass has been allowed to brown. The story of how the Williams sisters rocketed from the cracked courts in Compton to the grass at Wimbledon long ago became the stuff of legend, and the story of how the tennis world was thrown back on its (well-heeled) heels has been told a thousand times. But it’s still relevant here, and so it’s worth remembering just how many tennis fans, especially those who fit the profile of your typical resident of Palm Desert, were disinclined to give the Williamses the kind of respect that they were very quickly demonstrating was their due. Their father was too aggressive, too aggrandizing, too crazy and too confident; and the girls were too black, too loud, too different, too good, and too much of a reminder of the world that existed just beyond the margins of the desert, the moat that protected the advanced irrigation systems of this desert garden from the rest of the world. Tennis, of course, was already becoming a global game, pursued by the young daughters of farmers and brewers in Eastern Europe and by the Scottish sons of single mothers, by kids in war-torn Serbia and industrializing China. But in the United States, with its terrible legacy of race relations and persistent segregation, it was still a sport most closely identified with country club dress codes.1 So the Williams sisters represented a very specific, unsettling kind of challenge, which some people took as an affront. They couldn’t be easily assimilated into the traditional venues of the sport by any mental gymnastics of delusion and denial. They were who they were, and they weren’t going to apologize for it. It was called arrogance. What it was, in fact, was the consequence of their confidence. The Williams sisters won. And Serena? She had a way of winning that anticipated something no one had seen before. Of course, she won that match anyway. No other American athlete in my lifetime has been as strongly associated with winning as Serena Williams. Serena’s dominance is so great that it’s perversely underappreciated. It sometimes seems as if you’re doing her a disservice if you don’t take her for granted. The numbers you can use to describe it so exceed the normal measures of success that they break the scale. You win two major titles, and you’re pretty much a lock for the Hall of Fame; Serena has won 19 — and counting. She has earned more than $66 million in prize money, 65 career titles, 232 weeks at no. 1 (including, actively, 109 consecutive weeks). Her longevity makes them all the more mind-boggling. Here’s something to try to wrap your head around: She has won every single major at least 10 years apart. She loses, of course, but even her losses somehow seem to reinforce her overall superiority. When she’s defeated, she often seems to beat herself — usually in the early rounds, to players who have no business challenging her. Against the top players — the players who should push her the most — she’s almost unbeatable. Last year, she went 12-1 against the other members of the top 10, and it took her only a few days to avenge that one loss. Consider this: Serena has beaten the second-best player in the world 16 times in a row. But the numbers only go so far. There were record-breaking champions who preceded Serena, players with comparable hauls of grand slams (Martina Navratilova, Chris Evert, Steffi Graf), and there are players who have, at times, been able to challenge her (including her sister, though no one Serena’s played at least five times has a winning head-to-head record against her). Serena is different from all of them. She is different because of things out of her control — different because of where she’s from, different because of how she looks, different because of her family. But she is also different because winning seemed to be not only what she does, but who she is. Tennis is a sport that punishes winners. Serena tosses up balls and expects aces. She alters the dynamics of the game by the force of her being. “Her court for some reason seems to start shrinking and my court seems endless,” her former hitting partner, Sascha Bajin, told Sports Illustrated last fall. “And mentally that pressure is there from the moment she walks on the court.” The thrill of competition isn’t what drives her; it’s the need to win. Other players fight; Serena breathes. When billionaire Larry Ellison bought the tournament in 2009 and set about transforming it into the premier non-major, he was confronted with a problem: How can you be the best tournament when the best player refuses to be a part of it? (If you’re inclined to feel cynical about the tournament’s long campaign to have Serena return, simply note that it made no real overtures to Venus and Richard to do the same.) Without her, Indian Wells was a tournament with an asterisk. 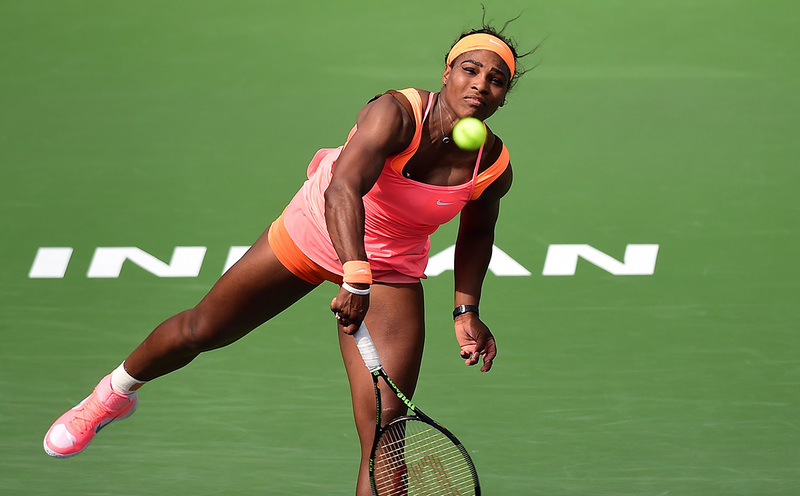 Indian Wells, it turned out, needed Serena much more than Serena needed it. Serena’s decision to return may be the right one for her now, as she sees it, but there’s no reason she had to. She could afford to forgo the millions of dollars in earnings, because she became rich; and the thousands of ranking points, because she became the best. She didn’t need the exposure, because she became famous. And she didn’t have to listen to those who criticized her for staying away, because she could draw strength from the power of her principles. She was the one who’d been hurt there; she had never done anything wrong. Over the course of their 13-year boycott, Venus and Serena became bigger than Indian Wells. In truth, Serena and Venus were already bigger than it — more interesting, more vital. Of course, it’s a sound decision for her tennis career, too. For years, her coach, Patrick Mouratoglou (who is, not incidentally, French), has been open about his desire for her to play at Indian Wells for strategic scheduling reasons. After her 7-5, 7-5 win over Niculescu in the second round, Serena said she didn’t need to hoist the trophy; she was just happy to be there. It sounded good, but I didn’t buy it. The rawness of her emotions has been evident. She was working through something painful, but there was also a kind of desperation for the moment at hand. Losing in her first match of the tournament wasn’t part of the narrative. Even by Serena’s standard, the Come On!s after winning the first set were exclamations of her determination. She won three matches after that. She never played her best — though well enough for a routine 6-2, 6-0 demolition of Zarina Diyas in the third round; a dig-deep defeat of Sloane Stephens, a young American who has beaten her in the past, in the fourth; and a solid win over the hottest player on tour, Timea Bacsinszky, in the quarters. It looked like the script would play out; the conquering hero would conquer. And then something extraordinary happened: Serena bowed out. There was an eerie, almost frightening moment on Friday night, just before the semifinal, when the news broke that Serena was withdrawing from the tournament with inflammation in her knee. The similarity of the timing with Venus’s withdrawal in 2001 was lost on no one. Now, of course, anyone in the crowd who had a smartphone could learn the news — but as the first semi, between Sabine Lisicki and Jelena Jankovic, dragged through a third set, there was no public announcement. After that match, Serena, wearing sweatpants, and the tournament MC came onto the court. He put his arm around her and — though somehow forgetting to mention her withdrawal — nervously but successfully coached the crowd through its response (they loved her, this was her home, she’s always welcome back, etc.). You could hear a few scattered boos, unbelievably and too predictably, but mostly there was applause. Tennis really has changed in some ways. Winning will help do that. Serena is, if not always loved in the United States, at least admired. The only person who refused to credit the coincidence was Serena herself. Venus’s withdrawal had been about 2001, she said when asked about it; this was about now. And you could dismiss this as one more part of the preplanned aspect of this return, a kind of disaster control. But she was right. She has Miami coming up, and before long the French Open. She is turning 34 this year. She tried getting an injection to help the swelling — the first time she’s tried that, she said — but it didn’t help. She has to be careful. Indian Wells is only one tennis tournament at the start of a long season. That’s all. In the final on Sunday, Simona Halep won a tight, three-set, error-filled match against Jankovic to win the title. Halep’s tenacious comeback and Jankovic’s canny, relentless tactics were impressive, but that’s pretty much the only nice thing I can say about that match. It was impossible not to feel that Serena would have crushed either one of them. Did it matter that she didn’t? Not at all. When asked if she’d be back, she paused, smiled, and called it a “must.” She is taking care of her body, care of herself. I think she has already done the hard thing. Indian Wells was restored to what it really is: an artificial garden in the desert, a tennis tournament. It never should have had a hold on her. Serena is on the cover of Vogue this week. The story inside looks at how she has “mellowed,” and uses her friendship with a hyperphotogenic blonde Dane, Caroline Wozniacki, as the main evidence. Things change, and they don’t. But the cover is Serena alone, and it tells a different story. It is arresting. It is Serena. She is the source of her own power, like the sun. I myself learned to play tennis wearing a white shirt and white skirt.